Drawing and painting require good hand coordination. The quality of pen and brush strokes improves with practice, and will improve within the session if you focus on them for a brief period before tackling your main drawing or painting. Some types of mark (e.g. fine cross-hatching) require a steady, very controlled hand. But more informal styles of work also require a technical warm-up . Loose, freely-drawn lines require the artist to move the arm in a sweeping fashion without losing control of the pen, pencil or paintbrush. The drawing hand needs to be relaxed without gripping, yet retain control of the drawing tool. Practice makes perfect, and it is good to remind your arm and hand muscles of what is required before you get going with the rest of the session. 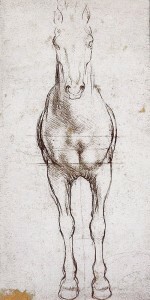 Right: Leonardo da Vinci front view study of the proportions of horses, showing remarkably delicate line control. Click on the image for a closer view. There are many different ways of looking at the world. When going about our day-to-day lives, we need to view our surroundings in a functional way in order to cope. We recognise shapes, patterns, and snippets of this and that in order to get through the day, whether we are walking on a busy street, recognising and greeting our friends or shopping. On the other hand, for most types of drawing and painting, the artist needs to view the world in a whole different way. When we enter the studio and embark on drawing or painting, we need to switch from functional everyday perception to a different way of seeing, and this can take some preparation. What do I mean by the artist’s way of looking and seeing? When working from life, many artists concentrate closely on one or more aspects of their subject. For example, they may look at shapes, tonal values, colour contrasts or proportions. If I asked you to put your phone on the table and draw it, you would need to look at it in an analytical, focused way while completing the task. Whether you embarked on a realist or semi-abstract image, your perception of your phone would be quite different to the way that you saw it the last time that you took a call. The task of producing a masterpiece from a blank canvas or sheet of paper can feel daunting. Warm-up exercises are completed for themselves rather than being destined for the gallery wall, so they can get you going in a more relaxed way at the start of your session. 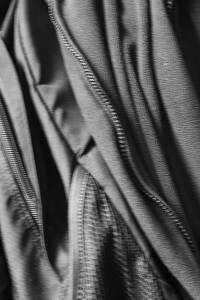 These warm-up ideas are intended to help prepare you mentally and physically for a session in the studio rather than providing you with a creative idea for your next project. I suggest doing just one or two of the exercises at the start of your session. A useful warm-up could take from one to about twenty minutes. If you spend much longer on such exercises, you risk procrastinating and avoiding the main creative task of the day. When to do this warm-up: This is a good all-purpose warm-up exercise. It is particularly useful if you intend to draw from a photo during the remainder of your session as it is very freeing. I also recommend doing this warm-up before copying any Old Master drawing as it helps to train your hand to make marks similar to those of the original artist. 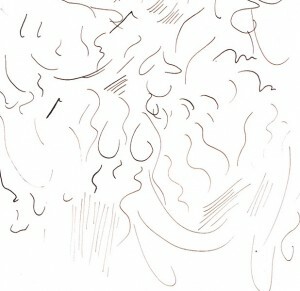 You need: A copy of any drawing that you admire, preferably one with sweeping lines. 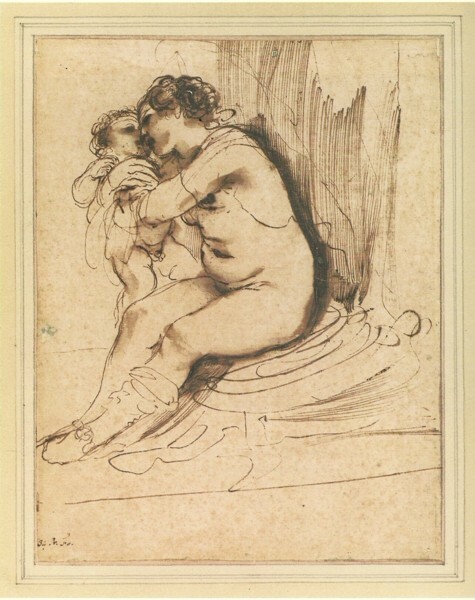 I particularly recommend using drawings by Guercino, Rembrandt, Delacroix, Leonardo da Vinci or Rodin, but the list goes on and on. Pick a medium similar to that of the original artist, e.g. pen and ink, pencil or compressed charcoal stick. You also need your sketchbook or a loose sheet of paper. 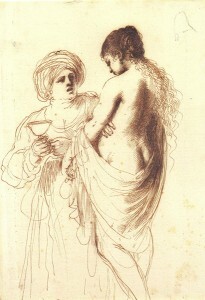 To do: Fill a page of your sketchbook with marks copied from the Old Master drawing. 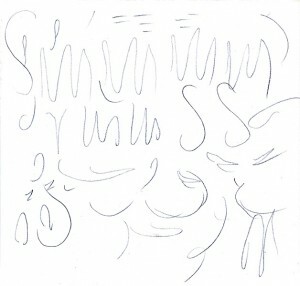 You should end up with an abstract page of scribble. Do not copy sections of the original drawing. Just pick out individual marks and copy these as best you can. As you copy the lines from your chosen picture ask yoursef the following questions: Are the lines sweeping, flowing, stabbing, curved or straight? If curved, then how much do they curve, and in which direction? Do the lines start faint at one end, then get fatter and heavier in the middle, then fade out again? Do the lines in the original picture vary in strength, or are they all the same? 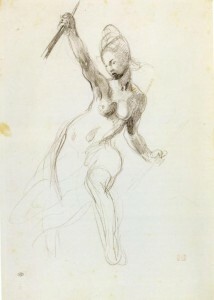 Above: Auguste Rodin “Red-haired woman standing”, pencil and watercolour wash, 30x19cm, n.d. Tips and hints: Whenever I try this exercise, I am always surprised by how difficult it is for my hand to copy another artist’s marks. Don’t be disheartened! Experiment with letting your wrist or elbow go more floppy and moving your pencil with a sweep of the whole arm. Also try out different pencil-holds. Try standing up, or sitting more squarely in your chair. If you are right-handed like me, then you may find it frustrating trying to copy Leonardo da Vinci’s drawings because he drew with his left hand. Start off by trying to copy the original artist’s marks but, in the end, the character of the lines is more important than an exact copy. Be aware of what the artist was aiming at with each line (a sweeping line or an elegant loop) even if your own hand doesn’t make quite the same mark. Adapt it:To warm up before a painting session, you can copy brush marks rather than drawn lines. Do this exercise on a piece of canvas paper or old board, or work over the top of a disastrous picture that was heading for the rubbish bin anyway. Try filling the space with marks copied from your favourite painter, e.g. Rembrandt or Constable. Aim to copy the length and direction of the brush strokes. Are they curved, sweeping or stabbing kinds of marks? Do they merge into one another, remain separate or overlap? You can use totally different colours from those in the original painting (perhaps use paint from yesterday’s palette if there is any left over) but aim for a similar consistency of paint as the original artist as far as possible. You may want to blend a painting medium (e.g. Liquin Impasto medium) into your paint so that your brush strokes leave clearer marks on the canvas. When to do this warm-up: To loosen you up, to reduce inhibitions and to inspire your curiosity. You need: A pyrex jug or bowl (e.g. 1L volume). A tablet of potassium permanganate. 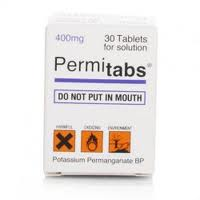 You’ll only need one tablet at most for this, but a pot of them can be obtained over the counter at chemist shops in the UK as Permi-Tabs. You’ll also need a kettle to boil water. Disposable gloves (or tweezers)are useful for handling the potassium permanganate and a craft knife is required if you are going to cut the tablet up. Choose your own art materials for this. You could just opt for pencil and paper. Or for a more bold graphite stick and paper. Or use one or more pastel sticks (colours of your choice) on paper or on gessoed card. You could even use oil paint if you wish. In that case, use one or more large brushes, well-primed canvas or board, and paint of your choice. I suggest using just one or two tube colours plus white. The chemical itself will appear vivid pink, but you could paint in a completely different colour if you wish. To do: Have your art materials ready (see above). Boil the kettle. I use just a quarter of a Permi-Tabs tablet in 1 litre of water. Wear disposable gloves and use a craft knife to cut the tablet. 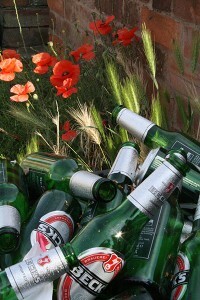 It may stain surfaces, so rest it on a bit of old disposable plastic or similar when cutting. Now just start drawing something of what you see. Rather than attempting an exact copy, start simply by suggesting the direction of the chemical streaks. 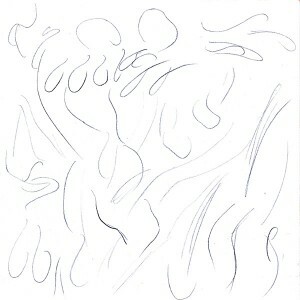 If using pen, pencil or other drawing medium, then you may like to make flowing, sweeping lines to suggest these streaks. If using pastel or paint, then you could either draw with your medium and make sweeping lines, or you could create bold zones of colour that merge into one another. 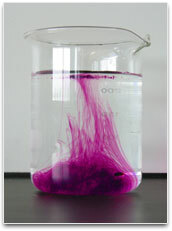 Above: Abstract image inspired by potassium permanganate dissolving in water. 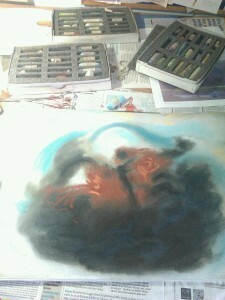 I have used Unison pastels. But don’t do: Don’t get the undiluted chemical on your hands or anywhere near your face as it stains skin and can be irritant. Don’t be tempted to draw with potassium permanganate itself – it produces an unpleasant brown mark and damages the paper. When to do this warm-up: This is a good one to do now and again before embarking on any composition as it’ll put you into the right frame of mind for the task of picture creation. It’ll get you thinking about tone and shape. You could do this before you even arrive at the studio, or as you first walk in. I suggest setting yourself a time limit on this warm-up so that you don’t get sucked into it for to long, e.g. 20 minutes. You need: A digital camera, preferably one that you can set to shoot in black and white. If working indoors, I recommend using a camera on which you can disable the flash temporarily. A location of your choice (e.g. your garden, your studio, a room of your house or a section of your street). To do: Let’s look at the camera option first. 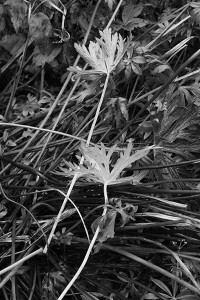 Set your camera to shoot in black and white. Look around your chosen location for interesting shapes of light and dark tone. 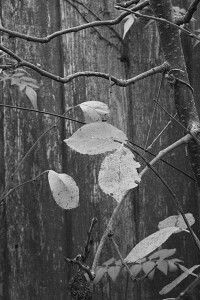 If you see a pattern of tones that could be interesting then view it through your camera. Can you point the camera to fill your shot with an interesting balance of light and dark shapes? Use your camera like an artist’s rectangular viewfinder, and decide which view is most balanced and pleasing. You can look from any angle. The purpose of this warm-up is simply to get you thinking about tone and shape in a rectangular picture format. You are taking these photos in order “to practise seeing”. The plan of this warm-up is not really to find soure material for your work that day. Don’t upload your photos or print them out during your warm-up period. This would only waste time. You can view and evaluate your photos much later if you wish (e.g. the next day), before filing or deleting them. But this exercise does not aim at producing a gallery-worthy photograph! Practical tips: If possible, avoid using flash on your camera for this exercise. This exercise is possible using simple automatic cameras and cameraphones (my art group have done this successfully). 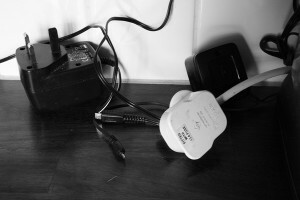 However, some control over your camera settings is preferable if you are shooting in dim lighting. When shooting indoors, set the camera ISO number to as high as possible (e.g. ISO 1600) and reduce the f-number to quite low (e.g. around 6). As you can see from my jacket picture above, I put up with a slow shutter speed and nasty camera shake as long as this avoids me having to flood my picture with flash light. 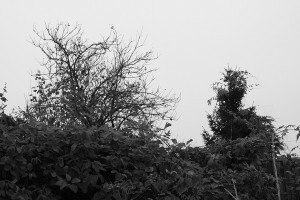 These pictures were taken on a Canon SLR 1000D. If you prefer to draw rather than to shoot photos, then use your pencil and sketchbook and make a series of little “thumbnail sketches”, each about 4cm by 6cm. Draw a rectangle or square as a picture boundary for each of these before you start. Find a view of your environment that has interesting shapes of light and shade. Draw a few lines within your rectangle to show where things should go. Look at your subject with half-closed eyes to help visualise shapes of light and dark. Then “block in” the shapes of dark tone within your rectangle using bold pencil cross-hatching. Leave paper white to show where the lightest shapes of tone should go. Adapt it: If your interest is colour then by all means use colour photography. See my own examples of this by clicking this link: Things seen on Walking the Dog. I’ll share more ideas for warm-ups in my next blogpost. There will be a line and wash warm-up, a continuous line exercise, and a warm-up for the oil painter. My plan is to draw and paint more and to talk less, so I expect these blogposts to become a little less frequent, perhaps every two to three weeks. If you would like future blogposts to arrive in your email inbox then just add your email address to the box at near the top of the page and click “Subscribe”. This service will of course always be free of charge. Hi Helene, Try clicking on each image to see it enlarged. Once you’ve done that, there should be enough detail visible. Hi there, I’m an artist living in the UK and I just wanted to let you know that I shared some of this post on my blog today :). Here is the link for your info. http://janehinchliffe.com/tips-benefits-loosening-up-with-watercolour-the-art-of-life-3/ What great suggestions for the artist and novice alike. Regards, Jane. Hi Jane, thanks for the message and for the share on your lovely website. Happy new year!